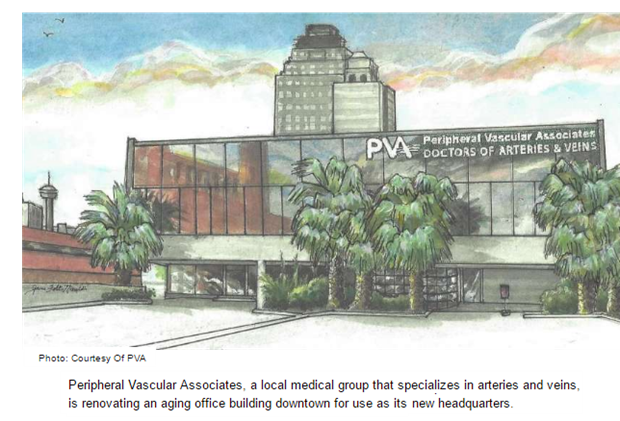 ​​​SAN ANTONIO – ​​​Peripheral Vascular Associates (PVA), a local medical company that specializes in arteries and veins, is spending $3 million renovating an aging office building downtown for use as its new headquarters. The company plans to move into the 35,000-sf building, at 610 N. Main, in July 2017, said its senior partner, Dr. Demetrios Macris. Its offices are currently located in the Baptist Medical Center Hospital in north downtown. The company wants to be downtown because the central location is convenient for its clientele, which largely comes from the South and West Sides and from towns south of San Antonio. PVA paid more than $3 million to buy the building and is spending another $3 million to renovate it, Macris said. The building was constructed in the 1950s and once served as a bank. ​​Check out San Antonio Medical Office Research.